Recognising his exemplary contribution to the country, LAUGFS Holdings Chairman, Mr. W.K.H. Wegapitiya, was awarded the prestigious “Hall of Fame” award by the Federation of Chambers of Commerce and Industry of Sri Lanka (FCCISL) at the 23rd Sri Lankan Entrepreneur of the Year Awards held recently. “Hall of Fame” is a lifetime award bestowed to recognise and honour entrepreneurs who have demonstrated outstanding achievements and have contributed to take the Sri Lankan brand to a global platform. Mr. Wegapitiya is renowned for his visionary leadership, with a strong ambition to constantly transcend the ordinary. His entrepreneurial journey has been marked by a pioneering vision to harness emerging market opportunities, enabling LAUGFS to become one of the largest diversified business conglomerates in the country today. In a mere 24 years, the company has rapidly grown by expanding into over 20 diverse industries in Sri Lanka, Bangladesh, UAE, USA and the Netherlands. Known for his strong work ethics, Mr. Wegapitiya’s entrepreneurial ethos has led to a culture of innovation and intrapreneurship at LAUGFS, resulting in many pioneering projects and business ventures, from the largest LPG Transshipment Terminal in South Asia to the largest solar power project in Sri Lanka. Driven by his patriotic love for the country, he takes great pride in building a truly Sri Lankan conglomerate that has rapidly expanded beyond the shores of Sri Lanka. A strong commitment to the growth and advancement of the country, its industries as well as the communities, has been an underlying ethos guiding how LAUGFS operates, which has driven its social, economic and environmental performance, from creating thousands of direct and indirect employment opportunities, to building and transforming local industries to compete effectively on a global platform. Over the years, Mr. Wegapitiya has been honoured with numerous local and international awards and accolades for his outstanding contribution to the country and its industries. These include the ‘Entrepreneur of the Year’ award at the Asia Corporate Excellence and Sustainability Awards (ACES), the Asian Grid Leadership Award for Excellence in Entrepreneurship as well as the ‘Ada Derana Sri Lankan Entrepreneur of the Year’ Award. He has also been bestowed with the Deshabandu title, which is an extremely rare and highly prestigious national honour. LAUGFS is one of the largest diversified business conglomerates and a trusted name in Sri Lanka. Founded in 1995, it has rapidly expanded, building a strong presence spanning the power and energy, consumer retail, industrial/manufacturing, services, leisure and logistics sectors. 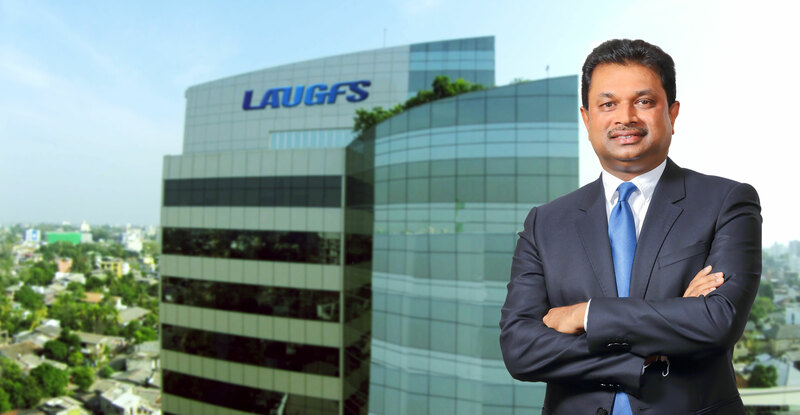 LAUGFS today employs over 4,000 employees with an annual turnover exceeding Rs.37 billion.